The Food Alphabet and More: Win this Lechon for DAD with Breakfast Magazine! Win this Lechon for DAD!!! 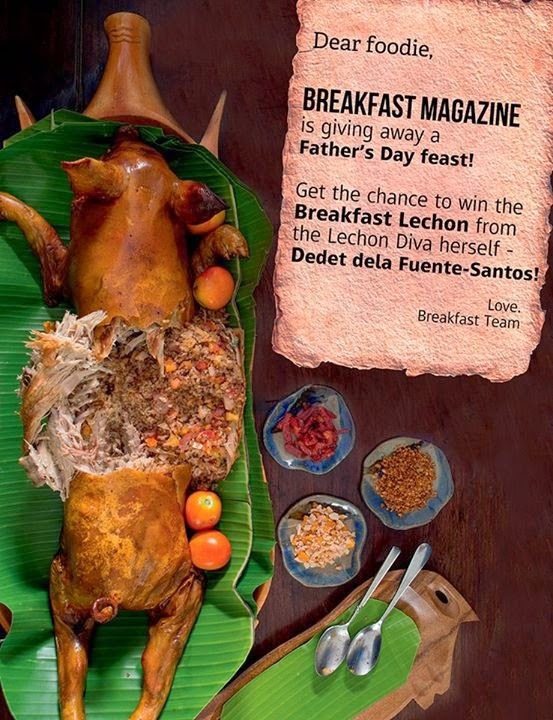 Father's day is just around the corner, and what better way to show your dad how special they are by joining Breakfast Magazine’s Father’s Day contest and get the chance to win the unique Breakfast stuffed lechon by the Lechon Diva herself – Ms. Dedet dela Fuente-Santos! Finalists will then be announced on June 13 and their photographs will be posted on Breakfast Magazine’s Facebook page. It is then the finalists’ task to garner as much likes as they can on their respective photograph. The finalist with the most likes by June 14 would be the winner! Just imagine how happy dad would be when he finds out you got him a lechon present! Click HERE to know more on how win the Breakfast stuffed lechon by Ms. Dedet and The Breakfast Magazine.